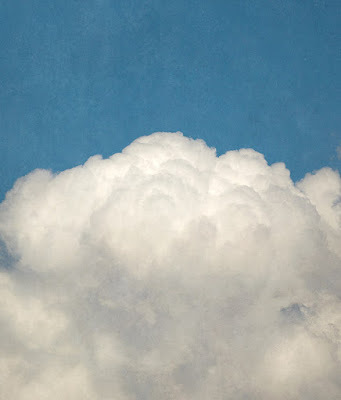 ...about trend forecasting: partly, mostly, beautifully cloudy. Maybe it was the all-too-brief trip to Fire Island to which I was treated, where the sky still manages to upstage the rest of the island’s eye candy (well, most of it) with its constant, drifting day-and-night celestial show, shown off above a clear horizon that never seems to end, a giant upturned bowl of a sky. Maybe it’s living in Manhattan, where that same sky is parceled out like the real estate: in tiny squares and meager boxes, a mostly-blue-gray Mondrian. Maybe it was a weekend away upstate, where we watched an enormous thunderhead glow with lightning like a giant, short-circuiting Noguchi lantern. Perhaps this beach weekend, fragmented view and country light show have all conspired to make me miss the sweeping arcs of tropic sky I grew up with in South Florida: showy, hypnotic, and ever-changing, whether the great white anvils of afternoon thunder clouds behind a row of sherbet-y Miami Beach art deco hotels, the high cirrus feathers of winter, the puffy cumulus of summer, or the flame-edged cotton candy of a Key West sunset. Whatever it is, something’s in the air, and suddenly, I’m loving all things cloud. And I don’t seem to be the only one. 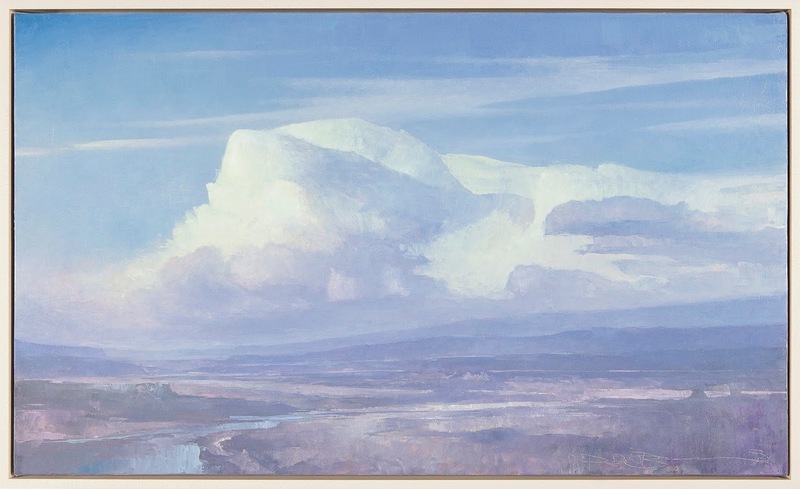 Clouds are drifting in everywhere, on magazine and catalog pages, gallery walls and across showroom floors. These motifs are certainly not new, but they are feeling, to me at least, very much of the moment. 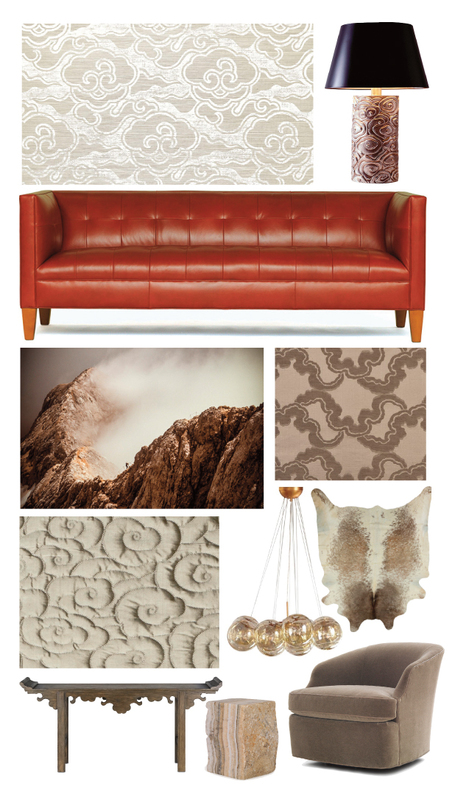 It’s the newest/oldest way to bring the outdoors in, on textiles, wallcoverings, rugs, lamps, fine art and accessories. It might have been Laura Kirar’s Kumo for Highland Court that started my own obsession: a tone-on-tone Chinese Deco-esque cloud pattern, pitched twice now in two colorways to clients who loved the ethereal, elegant textile. 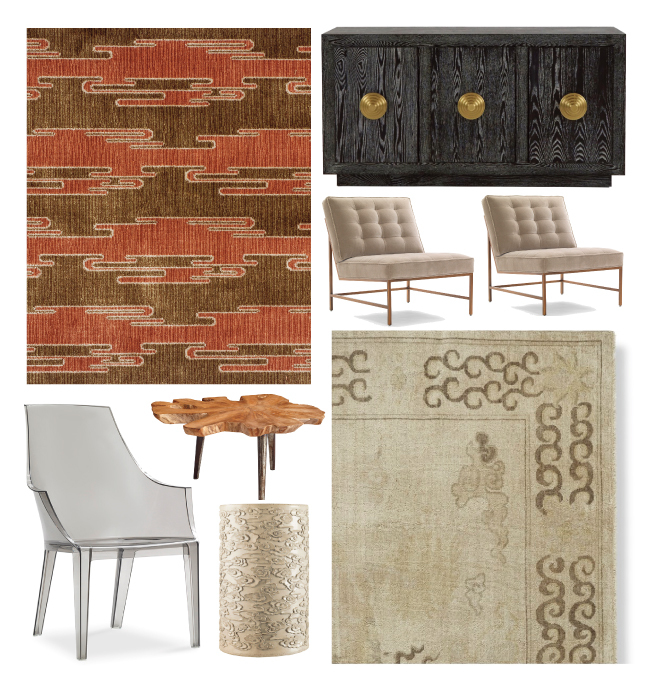 And Chinese and Tibetan versions have long appeared in the work of Robert Kuo, and rug-master Joseph Carini, and they’re just popping up in the fall collections at places like Williams-Sonoma Home. Those Chinese-inspired versions of the cloud pattern could anchor a rich, fresh traditional tone-on-taupe living room, pairing beautifully with smoky Lucite and burnished golds, where the motifs evoke opium-clouded decadence. This Dark and Stormy variation on the theme also drifts toward the smoke spectrum, of which I’ve sung the praises for New England Home's blog in the past. My thinking in any room is that every introduction needs a companion, and I’ve said in the past that everyone/thing in a room needs another friend at the party. So I’d use lots of these cloud items in tandem, at least. But with some care, I think you can build a room most securely and almost entirely on a cloudy base. Once you put on your cloud-colored glasses, lots of things start looking like they could be right at home in Bespin (for the Star Wars fans! ), specifically, other organic, outside-in materials, like striated onyx, mottled marble, live-edge woods and swirly burls (also deemed “of the moment” not long ago by Traditional Home). 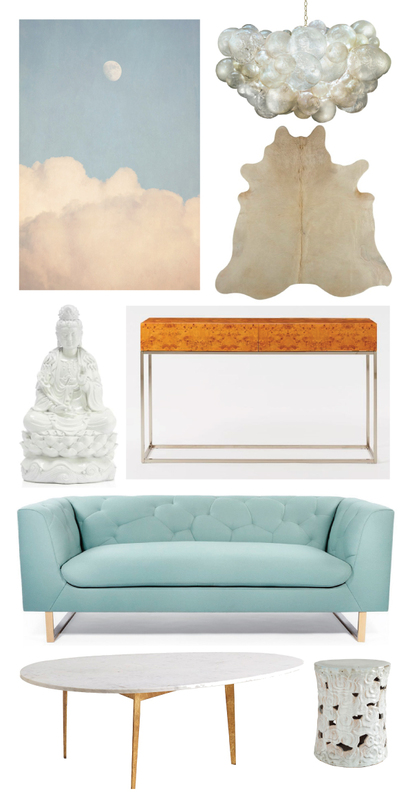 “Moon with Clouds,”Jefferson Hayman; Muriel Cloud Chandelier, Oly Studio; Ivory Cowhide, Jayson Home; Sitting Quan Yin, ZGallerie (no longer available; similar available); Burl Console, West Elm; Cloud Sofa, Ted Boerner, through Dennis Miller; Mid-Century Egg Coffee Table, Wisteria; Ceramic Cumulus Stool, Wisteria. Dreamy, cloud-inspired living rooms and bedrooms also spring to mind, where softer palettes seem perfect for relaxation and slumber. But clouds can take on a more graphic edge, in an über sleek and pop/Op art living room. Here, other modern materials like stainless steel, glass, Lucite, and acrylic play well with the celestial theme, since “shine” and “transparency” share lots of skyward similarity. I’d use the photo-real and surreal versions, with stronger color and an intentional use of black and white. 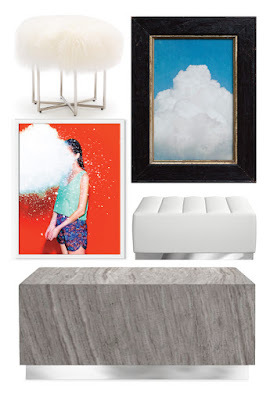 And what’s more cloud-like than a fur-covered pouf? 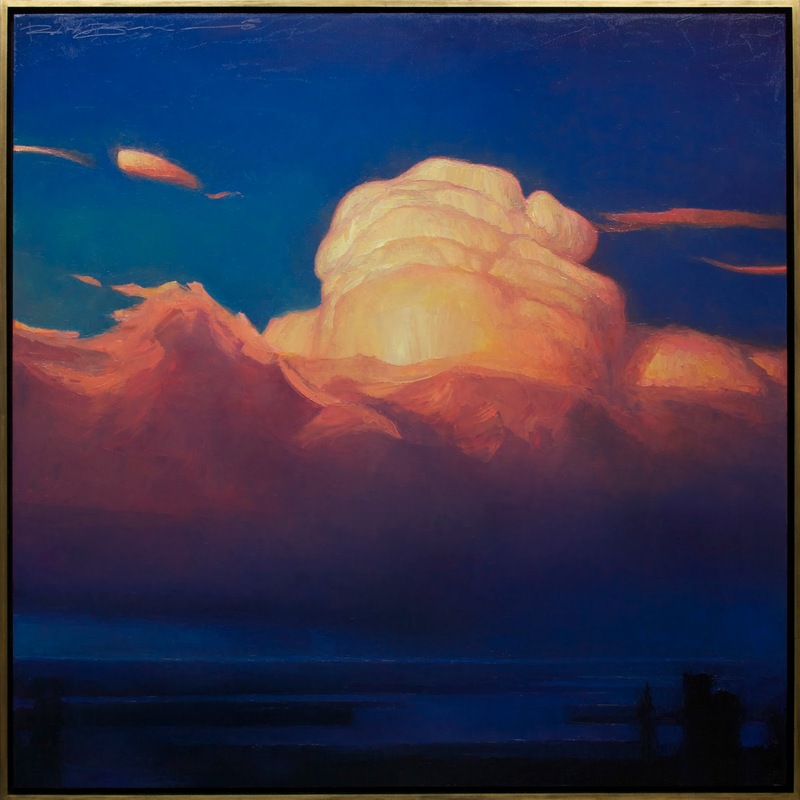 However clouds drift into your home, and however current they may seem, they’re all sure to stay timeless, and constantly inspiring. Anyone who’s ever pondered a summer sky for a full and dreamy afternoon can tell you that. Visit and Follow my Partly Cloudy Pinterest board!